Of the aforementioned structures, the common finding is degeneration. For example, the encephalon has decreased mass; the cerebellum, pons and medulla oblongata are atrophied resulting in a loss of neuronal cell bodies in the dentate nucleus, substantia nigra and anterior horn of the spinal cord. MJD is an autosomal dominant inherited disease. This means that a parent who has MJD has a 50% chance of passing down the affected allele to their offspring. Due to the fact that MJD presents its inheritance in a dominant pattern, there cannot be any recessive carriers of the disease. An individidual with the affected allele will always show the symptoms of the disease. A unique feature of MJD and most repeat genetic diseases is called ‘anticipation’. Anticipation is observed when children show an increased progression of the disease with earlier onset and worse symptoms when compared to their parents. This is thought to occur due to increased repeats of the mutation when passed down from generation to generation. The affected gene in MJD is referred to as ATXN3. A long and abnormal repeat of the “CAG” code is the causal factor behind the disease and the reason for the mutated protein called ataxin-3. This mutation causes the protein to fold abnormally, forming clumps called 'inclusion bodies' in the nucleus of affected central and peripheral nerve cells. The ataxin-3 is found in both neural and non-neural tissue throughout the body and is thought to help with protein quality control pathways. The exact mechanism of the toxic effects of the mutated protein ataxin-3 is presently unknown and the repeated CAG code only partially explains the effects of MJD. MJD is the most common form of spinocerebellar ataxia (SCA). On a global scale, spinocerebellar ataxia disorders are considered rare with a prevalence of 0.2-0.3 per 100,000. The epidemiology of MJD depends highly on a genetic predisposition. MJD is an autosomal dominant disorder, whereby individuals with a CAG expanded repeat sequence in the ATXN3 gene are affected. Both males and females have equal probability of inheriting/transmitting the defective MJD allele. MJD is most commonly found in individuals of Portuguese-Azorean descent. 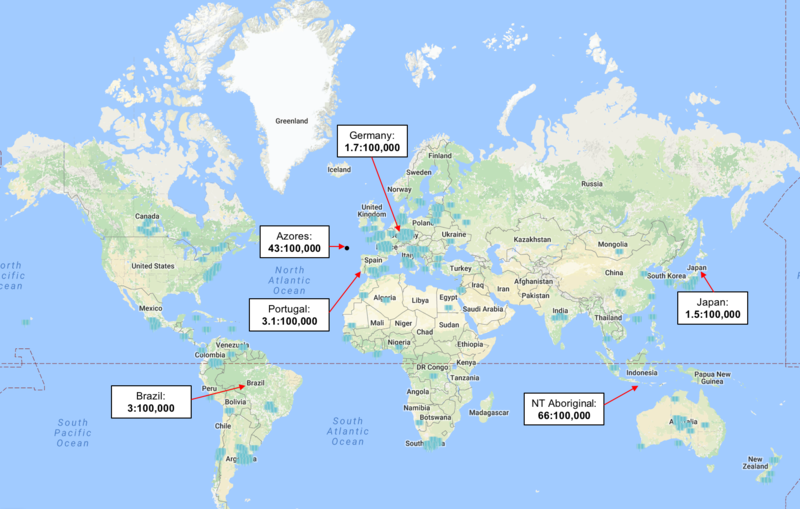 Worldwide, the areas with the highest prevalence of MJD have been documented to include the South East Asia/Australia border, Azores, Portugal and Brazil. The onset of the disease varies widely and is normally investigated when the individual starts portraying symptoms. The clinical presentation of MJD can vary depending on the subtype (type 1, 2, or 3). MJD can be classified based on the time of onset, progression, and severity of symptoms. The earlier the onset, the more progressive and severe the disorder is. Note: Cognitive functions are normally NOT impaired, which helps distinguish MJD from other neurodegenerative diseases. MJD is a highly genetic condition, where increased number of repeat sequences is correlated with faster progression of the disease. MJD is a progressive disorder whereby symptoms continue to worsen with time. Gait ataxia, dysarthria, dysphagia and fasciculations are symptoms that continue to progress as disease duration increases. Whereas visual impairments, opthalamoplegia and limb ataxia do not typically continue to worsen. As symptoms continue to progress, MJD becomes increasingly debilitating. It is most common to see a progressive decline in gait function and balance, as well as difficulties with the vestibular system and speech. The disease often progresses into a variety of visual and oculomotor issues, including nystagmus, jerky ocular pursuits, slowing of saccades, disconjugate eye movements, and ophthalmoplegia with lid retraction and apparent bulging eyes. It is common for individuals experiencing MJD to require gait aids, wheelchair devices, and increased assistance. Life expectancy varies depending on the type of MJD, however it is generally related to when the respiratory system becomes compromised. With less severe types of MJD, individuals can live a normal life expectancy. Individuals experiencing more severe forms of MJD typically live for 6-10 years with the condition before symptoms become too intense and death results, usually from aspiration pneumonia. In general, patients survive for ~20-25 years following disease onset. Molecular testing for the MJD mutation must be performed to confirm diagnosis. 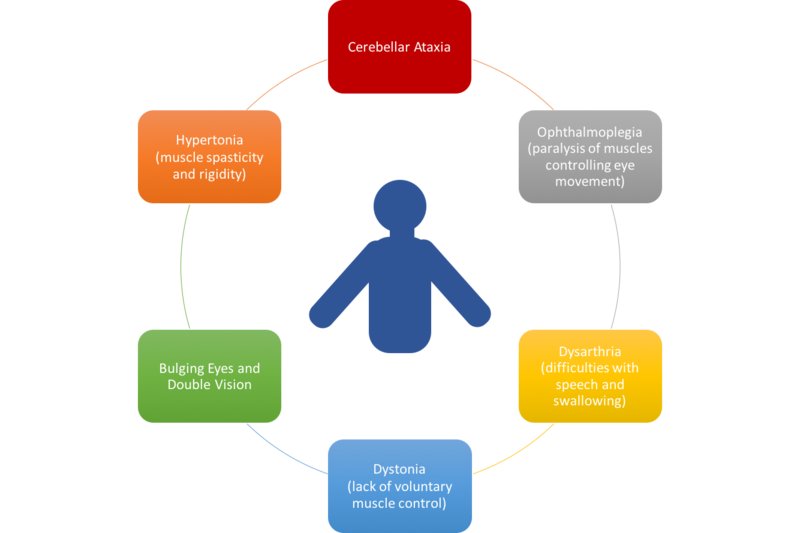 A physiotherapist may refer patient to a doctor when suspecting MJD with observation of symptoms indicating progressive ataxia and pyramidal signs. Genetic testing revealing CAG repeats are indicative of MJD diagnosis. The number of these repeats correlates with severity of the disease; increasing number of repeats corresponds with increased reflexes and mortality rate, and vise versa with decreased number of repeats. Type 3 MJD is specifically characterized by fasciculations. Health care practitioners must be cautious to rule out amyotrophic lateral sclerolsis (ALS), as the involvement of motor neurons causes the two conditions to present similarly. Upon autopsy, the following findings may be present; encephalon of decreased mass, pale-coloured substantia nigra, atrophied cerebellum, medulla oblongata and pons, as well as a decreased number of neuron bodies in the dentate nucleus, substantia nigra and anterior horn of the spinal cord. In order to assess the severity of MJD several scales specific to ataxia can be used. The International Cooperative Ataxia Rating Scale (CARS) and Scale for the Assessment of Rating of Ataxia (SARA) have been shown to be both reliable and effective when used with MJD. Due to their progressive nature, degenerative cerebellar diseases can be difficult to manage. Unlike ataxia following a stroke, which may permit unaffected, intact areas of the cerebellum to compensate for deteriorating areas, degenerative cerebellar diseases begin to affect essentially all parts of the cerebellum. Rehabilitation of motor impairments may also be made difficult because of the cerebellum’s role in motor-learning. Thus, low or poor rehabilitative progression indicative of low benefit may be caused by the inability of the damaged cerebellar structures to functionally participate in the relearning of motor skills. Although MJD may be difficult to manage, the cognition of these patients remains intact, making treatment plausible from comprehension perspective. There is currently no existing modifying treatment for MJD, and therefore, much of the disease management predominantly surrounds the non-motor symptoms. Such symptoms include pain, cramps, fatigue and depression. Treatment of the aforementioned symptoms as well as the treatment of sleep disorders, spasticity, parkinsonism, and dystonia must be acknowledged in attempt to improve the quality of life of those affected by MJD. The MJD Foundation illustrates very well what it is like to work with people affected by MJD. This video depicts their clinical approach to management of MJD. The cerebellum plays a crucial role in the control of an individual’s movement, taking part in the coordination of balance and locomotion. Thus, damage to the this region very characteristically translates into a dysfunctional form of movement referred to as gait ataxia. Gait ataxia presents itself as a highly variable type of movement pattern in which the individual has difficulties in maintaining postural balance while walking. Individuals with gait ataxia appear to walk in a “drunk-like” state. Much of the existing research encompassing coordinative training in degenerative cerebellar diseases is limited to single cases or studies of a small number of patients with varying levels of severity and forms of ataxia. For comparative sake, this makes it quite difficult to establish an idea as to what interventions provide the greatest benefit for patients with MJD. However, there is promising evidence suggesting that continuous training can in fact induce functional and stabilizing improvements in degenerative cerebellar diseases. There is evidence that improved postural stability, reduced dependence on walking aids, and increased independence can be achieved with the use of increasingly demanding balance and gait tasks. It is believed that postural stability may be improved in patients with MJD by the repetition of activities that challenge their stability. In addition, there is evidence that treadmills, both with and without the use of body-weight support, facilitate locomotion in patients that have more severe forms of ataxia. In some individuals, the benefits of gait training using a treadmill may be further improved when combined with overground gait training. Also, dynamic balance in posture and gait as well as intra-limb coordination, in both juvenile and adult patients with degenerative cerebellar diseases, have been found to improve with intensive whole-body coordinative training. In fact, continuous coordinative training may reduce ataxic symptoms (ie. gait-like velocity, lateral sway, and intralimb coordination) that not only contribute to improved stability and motor performance but also provide the patient with increased quality of life. It is thought to be true that exercise and physical therapy programs allow patients to better cope with their disabilities, even though there is a lack of evidence suggesting that exercise plays any part in slowing the progression of the disease. Much of the coping is believed to come from positive changes in psychological well-being including a greater sense of control over the disease, improved mood, and an increase in one’s self-esteem. However, exercise is clinically shown to help with short-term management of symptoms and reduction of comorbidities. As the risk of falls becomes increasingly apparent with disease progression, it is important that the patient’s safety in day-to-day activity becomes a priority. It may be necessary that the patient be evaluated for appropriate physical aids such as a cane, walker or wheelchair and assistive devices that can be implemented at home.Implementation of safety measures not only reduce the risk of falls and fractures but also allows the individual to maintain their independence for as long as possible. Much of the pharmacological evidence related to the management of MJD revolves around symptomatic treatment. Although there are a variety of medications that are used to manage a wide range of symptoms, there is a lack of evidence illustrating how these medications specifically affect the MJD population. It is important that a physiotherapist be aware that medications may have a significant effect on the rehabilitation process and on the capabilities of the patient during treatment. A physiotherapist's role in the assessment of MJD will often come after a referral from a doctor who has diagnosed and cleared the patient for exercise training. It is then the physiotherapist’s job to provide a full evaluation of the individual and create an appropriate exercise program. Acknowledgement of dysarthria and dysphagia via regular speech therapy as well as occupational therapy may also help to manage the disease. Overall, evidence-based management parameters are still rather vague and non-specific, and there is a general consensus that this area of research needs to be improved. It would be beneficial if further research was done to differentiate between types of interventions, to determine the particulars of training paramaters, and to provide various approaches to training that correspond to the level of severity of ataxia. ↑ 1.00 1.01 1.02 1.03 1.04 1.05 1.06 1.07 1.08 1.09 1.10 1.11 1.12 1.13 1.14 Pedroso JL, de Resende Pinto WB, de Souza PV, Andriotti C, Stavale JN, Barsottini OG. Anterior horn degeneration in Machado-Joseph disease. Journal of the Neurological Sciences. 2016 Sep 15;368:290-1. ↑ 2.0 2.1 2.2 2.3 2.4 2.5 Gilman S. The spinocerebellar ataxias. Clinical neuropharmacology. 2000 Nov 1;23(6):296-303. ↑ 3.0 3.1 3.2 3.3 3.4 3.5 3.6 3.7 "Machado-Joseph Disease Fact Sheet | National Institute Of Neurological Disorders And Stroke". Ninds.nih.gov. N.p., 2010. Web. 6 May 2017. ↑ 5.0 5.1 5.2 5.3 Van de Warrenburg BP, Sinke RJ, Verschuuren–Bemelmans CC, Scheffer H, Brunt ER, Ippel PF, Maat–Kievit JA, Dooijes D, Notermans NC, Lindhout D, Knoers NV. Spinocerebellar ataxias in the Netherlands Prevalence and age at onset variance analysis. Neurology. 2002 Mar 12;58(5):702-8. ↑ 6.0 6.1 6.2 6.3 6.4 6.5 6.6 6.7 6.8 6.9 Jardim LB, Pereira ML, Silveira I, Ferro A, Sequeiros J, Giugliani R. Neurologic findings in Machado-Joseph disease: relation with disease duration, subtypes, and (CAG) n. Archives of neurology. 2001 Jun 1;58(6):899-904. ↑ 7.0 7.1 7.2 7.3 7.4 Gaspar C, Lopes-Cendes I, Hayes S, Goto J, Arvidsson K, Dias A, Silveira I, Maciel P, Coutinho P, Lima M, Zhou YX. Ancestral origins of the Machado-Joseph disease mutation: a worldwide haplotype study. The American Journal of Human Genetics. 2001 Feb 28;68(2):523-8. ↑ 9.0 9.1 Maciel P, Gaspar C, DeStefano AL, Silveira I, Coutinho P, Radvany J, Dawson DM, Sudarsky L, Guimarães J, Loureiro JE, Nezarati MM. Correlation between CAG repeat length and clinical features in Machado-Joseph disease. American journal of human genetics. 1995 Jul;57(1):54. ↑ 10.00 10.01 10.02 10.03 10.04 10.05 10.06 10.07 10.08 10.09 10.10 10.11 10.12 10.13 10.14 10.15 D'Abreu A, França MC, Paulson HL, Lopes-Cendes I. Caring for Machado–Joseph disease: current understanding and how to help patients. Parkinsonism & related disorders. 2010 Jan 31;16(1):2-7. ↑ Vaz DV, Schettino RD, Rolla de Castro TR, Teixeira VR, Cavalcanti Furtado SR, de Mello Figueiredo E. Treadmill training for ataxic patients: a single-subject experimental design. Clinical Rehabilitation. 2008 Mar;22(3):234-41.